Q. I am not sure what type of sources I need. Many of these sources can be accessed through the NOVA library catalog and databases. You can also learn more about research sources from the Purdue Online Writing Lab. the purpose of the writing. Authors of credible information also acknowledge and list the other works they used in their research. Primary sources are another type of resource, that are more frequently used in subjects like history. When in doubt, ask your NOVA librarians for help. 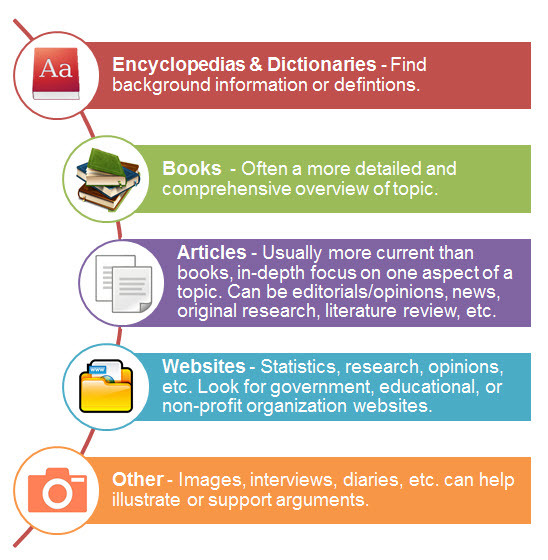 Accessible version of chart showing how different sources can be used.